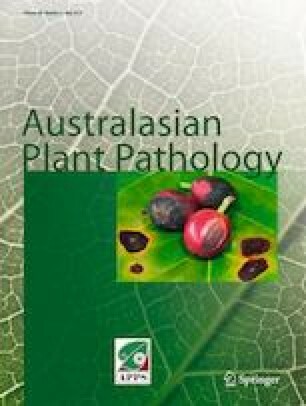 Ascochyta blight (Ascochyta fabae) and cercospora leaf spot (Cercospora zonata) have been observed on the same faba bean plants, even on the same leaf, in southern Australia. Ascochyta blight has long been prevalent and cercospora leaf spot has become more common in recent years, but their interactions have not been studied. Potential mechanisms of interactions between A. fabae and C. zonata in vitro and on faba bean plants were investigated. The interactions between isolates of each of the two pathogens varied within species. Ascochyta fabae isolate 55/01 and Cercospora zonata 69/04 inhibited the opposing fungus when exposed to volatile metabolites. In dual culture on agar medium, interactions between the species ranged from neutral to antagonistic. In dual inoculation experiments on faba bean plants in a greenhouse, the severity of cercospora leaf spot decreased in the presence of ascochyta blight, however, the severity of ascochyta blight increased on plants showing symptoms of cercospora leaf spot. These findings suggest that the widespread adoption of ascochyta blight-resistant cultivars and, therefore, reduced competition from A. fabae, may have contributed to the increased prevalence of cercospora leaf spot. We thank Dr. Dale Godfrey and Michelle Russ for invaluable assistance throughout the project, and Dr. Olena Kravchuk for advice on statistical analysis. Australian Aid for International Development and the Iraqi Ministry of Science and Technology supported the first author.